Click here to selecta chapter. Click arrows to movefrom page to page. Or use the left and right arrow keys on your keyboard to flip through pages. There is no position like it in all of sports. You can gather up all the baseball pitchers and basketball point guards and hockey goalies. You can combine all the soccer strikers and tennis players and golfers and downhill racers and 100-meter sprinters. You can put all of them together and still they do not equal the quarterback. For it is the quarterback who commands the most complex and violent game on earth; it is he whom we watch, our eyes frozen on his form, our ears attuned to his signals. It is he who gets the money, the power and the girl. The quarterback is king, and the NFL quarterback is the king of kings. He comes in all forms. He can be coolly elegant, like Joe Montana, or a wild gunslinger like Brett Favre. He can have the intellectual brilliance of Peyton Manning or the exuberant athleticism of Steve Young. He can be drafted early, like Terry Bradshaw (and many others), or he can be drafted late, like Tom Brady, or not even drafted at all, like Kurt Warner. He can emerge from the black-and-white images of a bygone NFL like Sammy Baugh and Norm Van Brocklin; or he can help usher in the new era of the multiskilled athlete like Colin Kaepernick, Andrew Luck or Russell Wilson. His arm can be a quick-release cannon like Dan Marino’s or a deadly accurate popgun like Drew Brees’s. He can be big like Daunte Culpepper or small like Doug Flutie. He can stand still in the pocket like Dan Fouts or he can run around like Fran Tarkenton. He can be white, like almost all quarterbacks in the history of the game, or he can be black, like more with every passing season until, blessedly, it’s nearly not worth mentioning. 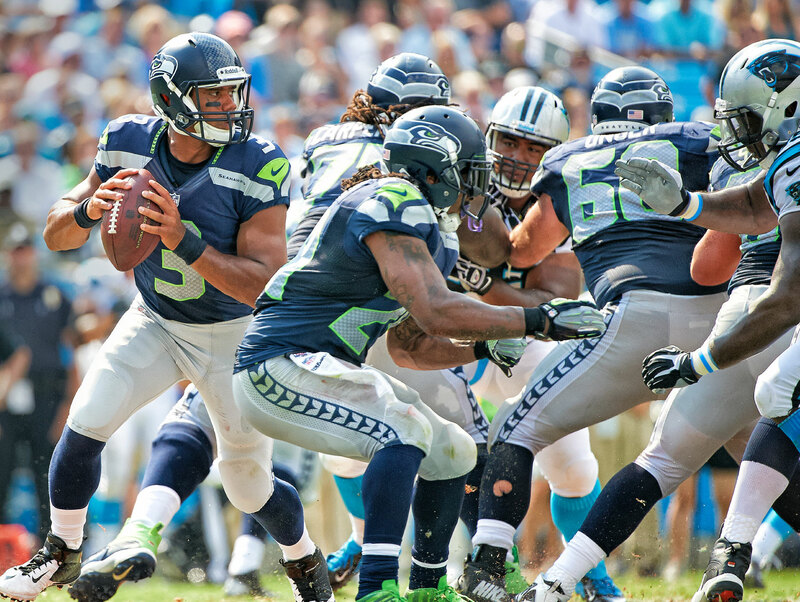 There is no template for the NFL quarterback except that he must lead and he must win. For this he reaps the greatest rewards and suffers the most punishing critiques. He stands at the top of the hill, and he is alone. From Tim Layden’s Introduction to NFL QB: The Greatest Position in Sports. 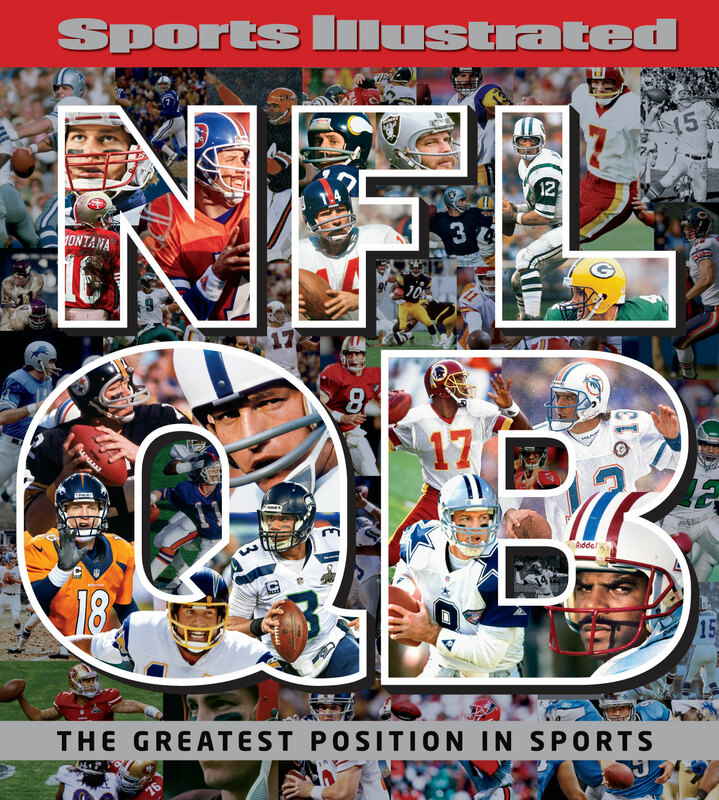 Sports Illustrated Books’ newest release examines every aspect of pro football’s most iconic position through original essays, classic prose from the magazine’s archives and insights from Hall of Fame players, all set against the most striking photographs ever taken on the subject. 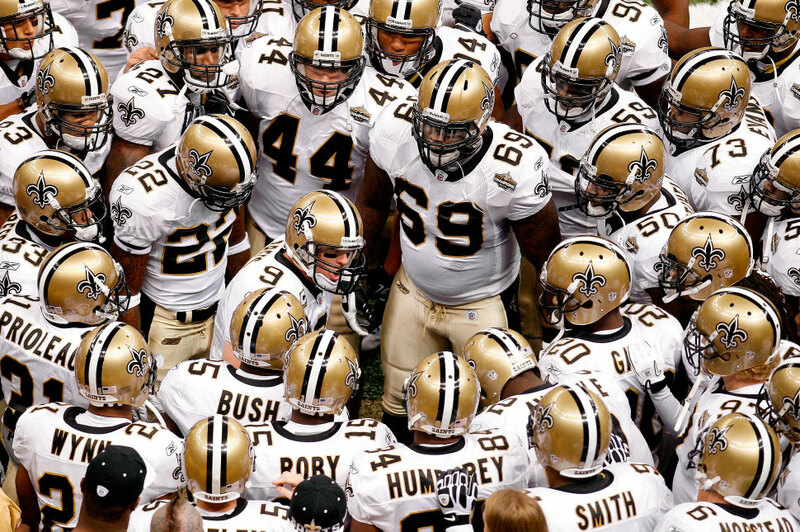 All eyes were on Drew Brees (9) as he fired up his Saints teammates in the moments before the kickoff of a New Orleans victory over Minnesota in 2010. Classic QBs (from left) Bobby Layne, Johnny Lujack and Sid Luckman of the Bears in 1948. New York Jets quarterback Broadway Joe Namath entertained the press and well-wishers poolside in Fort Lauderdale before delivering a seismic upset of the Baltimore Colts in Super Bowl III. 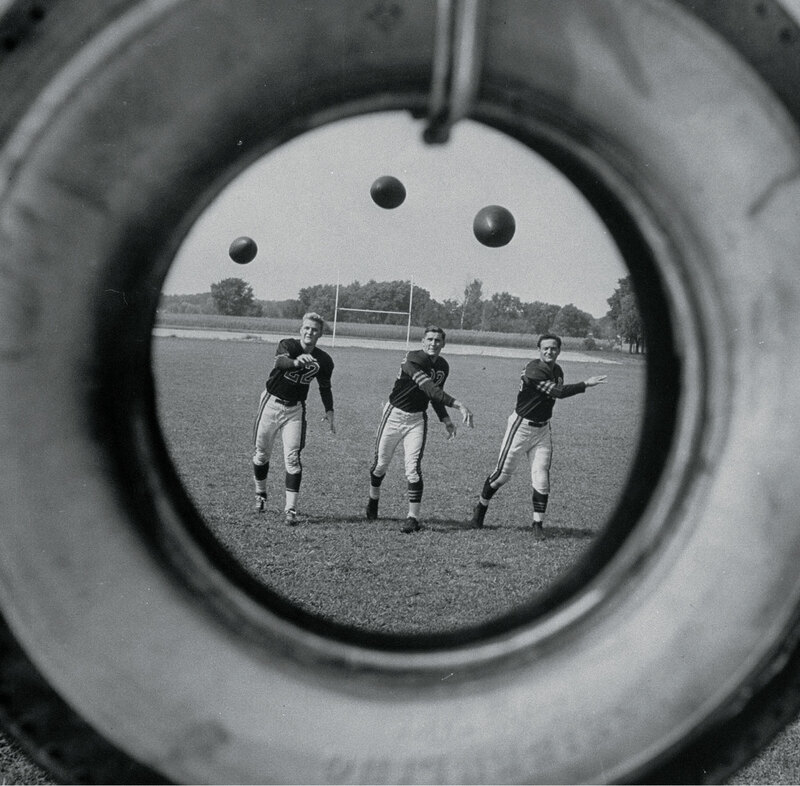 Photograph by Walter Iooss Jr. 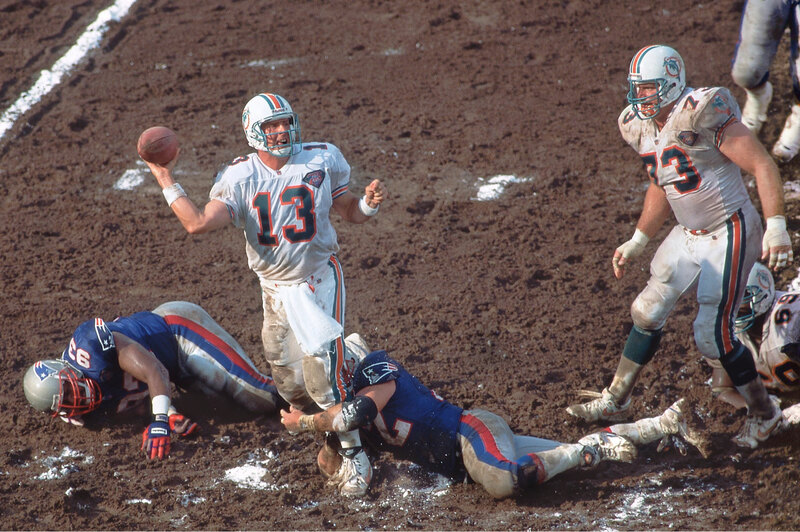 Even with his feet on unsure turf while in the grasp of a Patriots defender, the Dolphins’ Dan Marino was still an armed and dangerous threat. 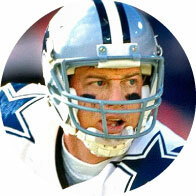 TROY AIKMAN The strength of his right arm carried Dallas on its greatest run ever, winning three Super Bowls in a four-year span, from 1993 to ’96. When the Broncos system breaks down, Elway puts in his own system—scrambling out of the pocket, dodging a rusher, always looking downfield. Then comes a flick of the arm and from nowhere one of Denver’s fleet receivers materializes 40 yards downfield with the ball in his hands. JOHN ELWAY His superior athleticism and cannon of an arm weren’t confined to football; he was a promising rightfielder in his lone season as a Yankee farmhand. 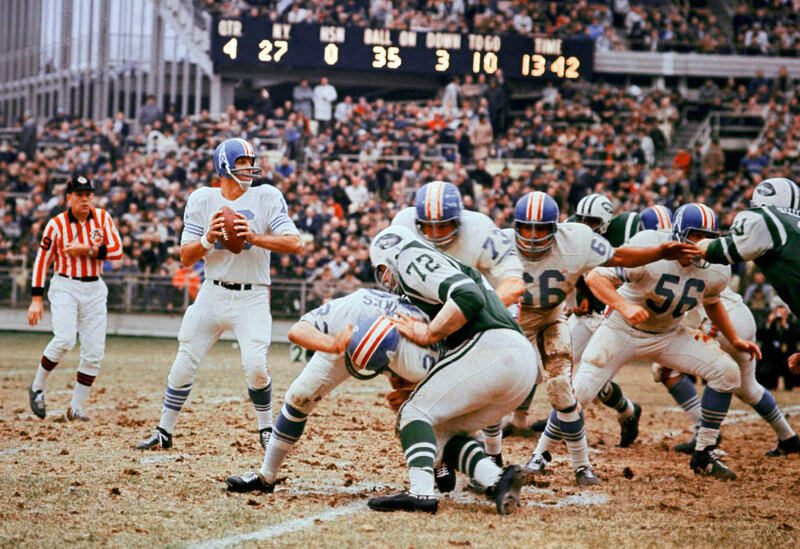 GEORGE BLANDA He may be best known for his longevity (a record 26 seasons at quarterback and kicker), but his passing led the Oilers to the first two AFC titles, in 1960 and ’61. 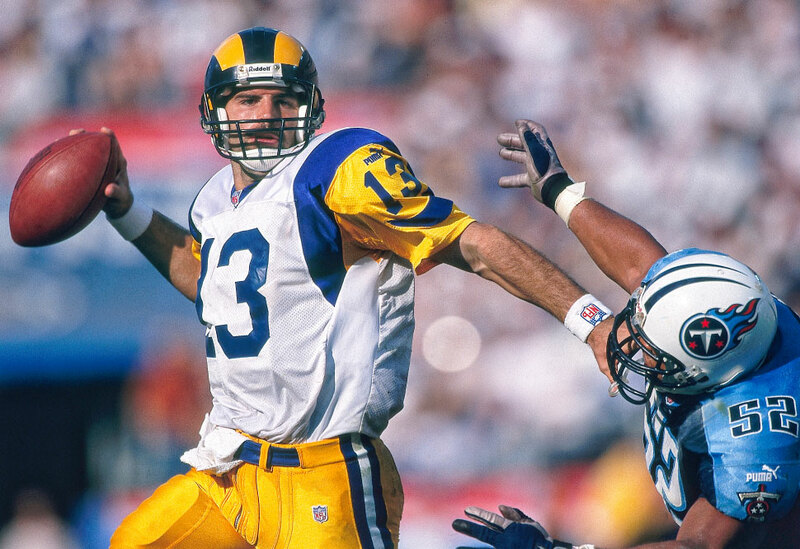 KURT WARNER An undrafted free agent, he went from the Arena League to NFL MVP with a Rams offense that would become known as the Greatest Show on Turf. 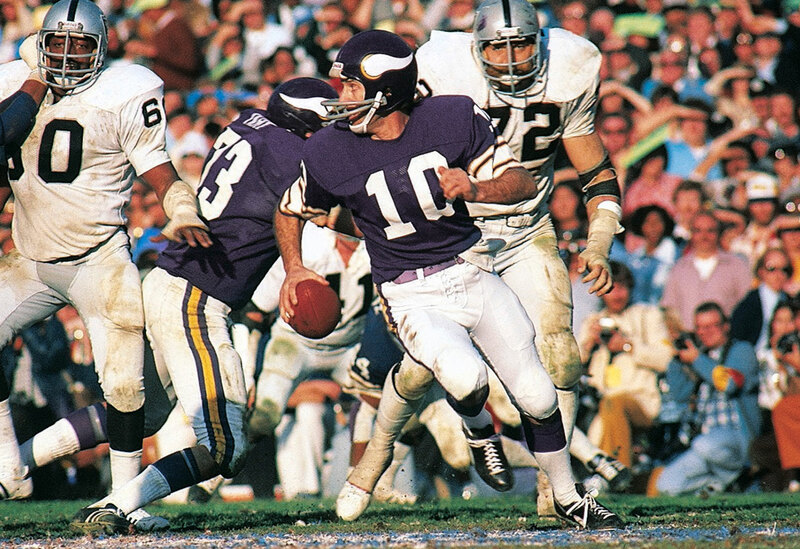 FRAN TARKENTON Defenders wanted to dismember the man, but for all his scrambling he still only missed 15 starts in his 18 NFL seasons. 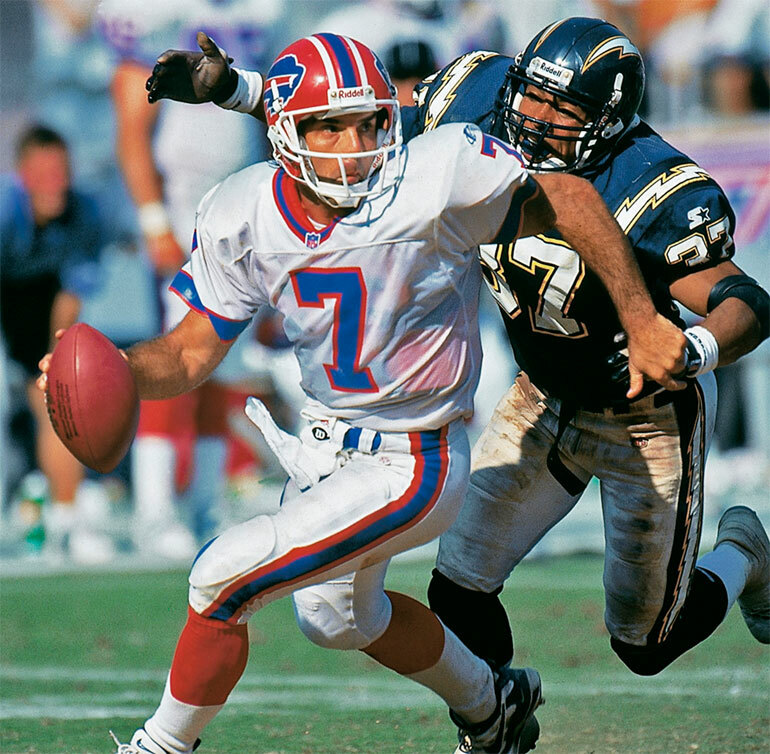 DOUG FLUTIE Written off as too small at 5-10, the 285th pick in the 1985 draft lasted 21 pro seasons, thanks to his knack for escaping pressure and making plays. The Bears quarterback this season will be either Jack Concannon or Bobby Douglass. Concannon would make a good receiver and Douglass is a natural to be the Bears’ starting fullback. However, they insist on playing quarterback. BOBBY DOUGLASS In 10 seasons he threw just 36 touchdown passes and 64 interceptions, but his 968 rushing yards (in 14 games) for the Bears in 1972 stood as a QB record for 34 years. 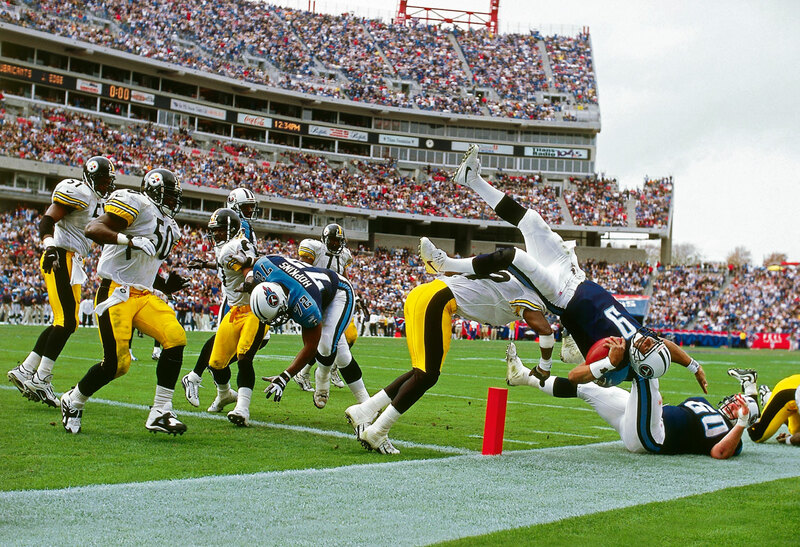 STEVE McNAIR He threw well enough to be known as Air McNair, but his legs helped carry him to three Pro Bowls, a co-MVP and the Titans’ only Super Bowl. 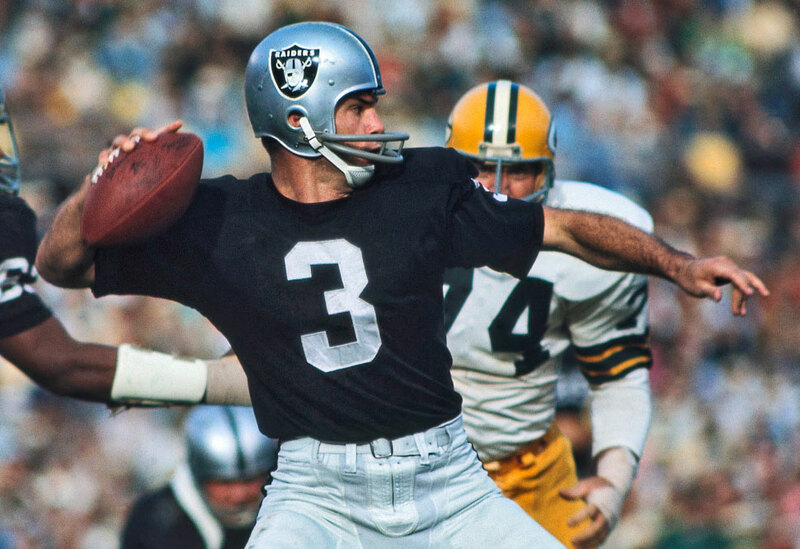 DARYLE LAMONICA The Mad Bomber led Oakland to Super Bowl II and, at 66-16-6, has the second-best winning percentage ever, behind that of Otto Graham. 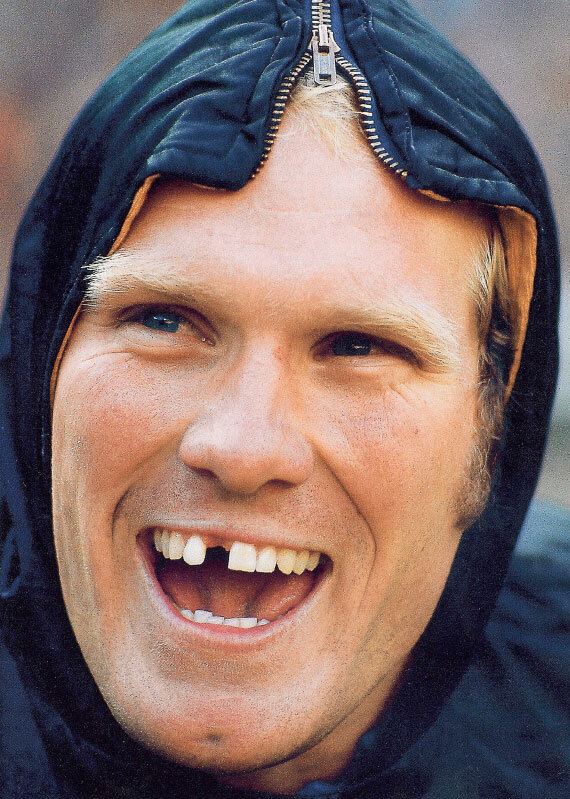 TERRY BRADSHAW Standing in for an extra count may have cost him cosmetically, but his big throws to Lynn Swann and John Stallworth made the Steelers fearsome. 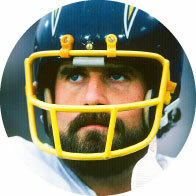 Van Brocklin was football’s premier bombardier. In his record-setting [554-yard] game against the Yanks in the 1951 season opener, he threw 41 passes and averaged an astonishing 20.5 yards for his 27 completions, good for five touchdowns. 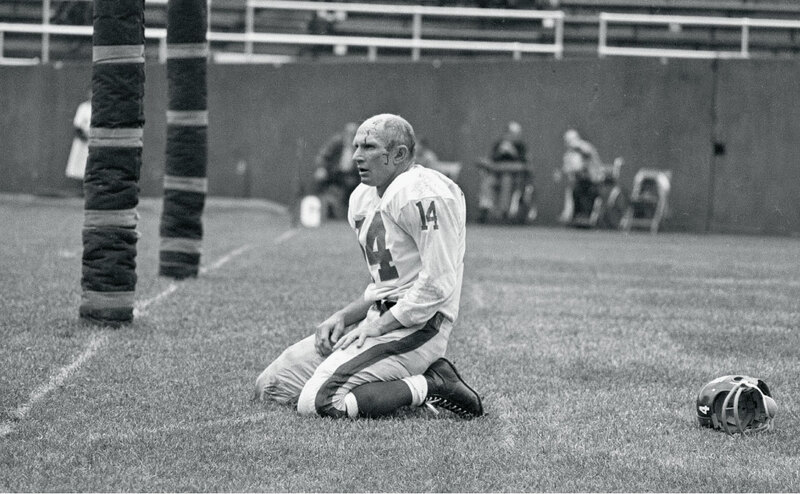 NORM VAN BROCKLIN The Dutchman, a nine-time Pro Bowler in 12 seasons, famously platooned with Bob Waterfield on the Rams before winning a title in Philly. Tough can be good (“tough as nails”) and tough can be bad (“tough luck”) and tough can be good and bad at the same time (“tough love”). Tough can cut both ways—or can’t be cut at all, in the case of a tough steak—leaving us with a serious question: Is tough a compliment (“He’s one tough SOB”) or a pejorative (“What are you, a tough guy?”) or something in between? This ambiguity is at the heart of football tough guys, who have long been praised for playing through pain and lately—given all we now know about the concussed brain and chronic traumatic encephalopathy—criticized for wantonly abusing their bodies. A huge Steelers hit left Tittle concussed and—in his mind, maybe worse—intercepted for a touchdown. Those players most deeply acquainted with professional football’s theater of pain are NFL quarterbacks, who were once collectively described—by pain-inflicting Hall of Famer Warren Sapp—as the “piñatas of sports.” Of these piñatas, Packers quarterback Brett Favre was renowned as especially tough, resistant to the assaults of men like Sapp, who once hit Favre so hard that officials on the field were scanning the tunnels for an ambulance even as the defensive tackle was bearing down on Favre from the blind side. Favre’s pain threshold was off the (hospital) charts, so fans and journalists naturally projected that quality onto his interior life as well. When his father died in 2003, and the next night Favre played in a Monday Night Football game against the Raiders—and threw for 399 yards and four touchdowns in a 41–7 win—he appeared to possess a superhuman capacity to absorb physical and emotional pain. That he struggled with addiction to painkillers was understandable, because few players had quite so much pain to kill—kill being a word often linked to the word quarterback, homicide apparently being the first motive of an NFL defensive lineman when the ball is snapped. 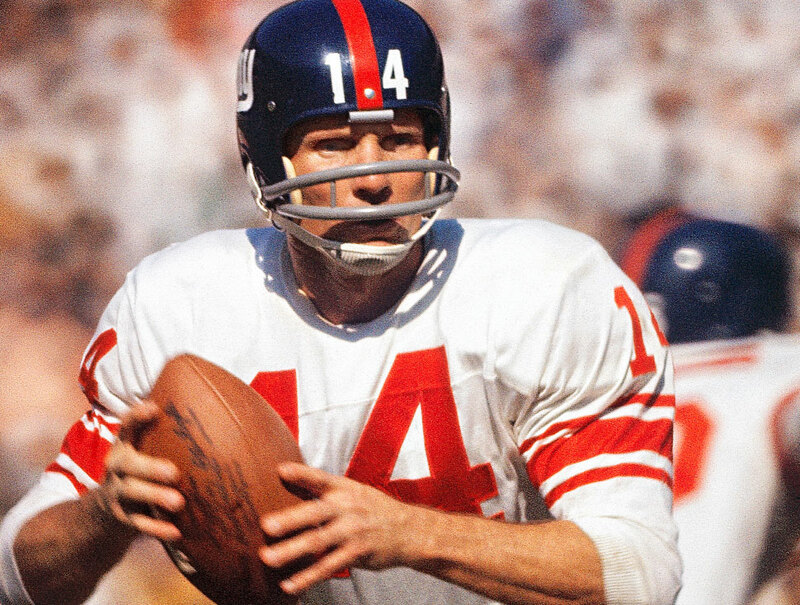 “The name of the game is ‘Kill the Quarterback,’ ” Joe Namath has said many times, most recently in 2014, when he acknowledged his own brain damage from multiple concussions. And while quarterbacks in the modern era are often seen as overprotected—coddled is a word that comes up often, spoken mostly by men who never played quarterback in the NFL—they weren’t protected at all for most of the game’s history. Bobby Layne played smash-mouth football when mouths could still be comprehensively smashed: The Lions and Steelers quarterback was among the last players to start using a face mask. He didn’t wear pads in his pants so as not to inhibit his running. What’s more, Layne frequently played hungover, so that his toughness took on a kind of Rat Pack grandeur in that decade—the ’50s—when going on stage buzzed or hungover was looked on as a badge of manliness. Layne would eventually accept the minimal protection of a single-bar face mask, which in turn would become the tough-guy hallmark of Billy Kilmer, who was badly injured in a car wreck in 1962 when he fell asleep at the wheel and ended up in San Francisco Bay. Kilmer suffered a compound fracture to his right tibia, and he nearly lost his entire foot after an infection set in. During his rehab he worked in the terrible heat of his father’s dry-cleaning business. Pressing pants in Pomona—now there’s a title for a memoir—Kilmer vowed that he would not do that for the rest of his life. And so this trial by fire, this trial by dry-cleaning steam press, steeled him to all manner of future assaults that he would suffer in the NFL. 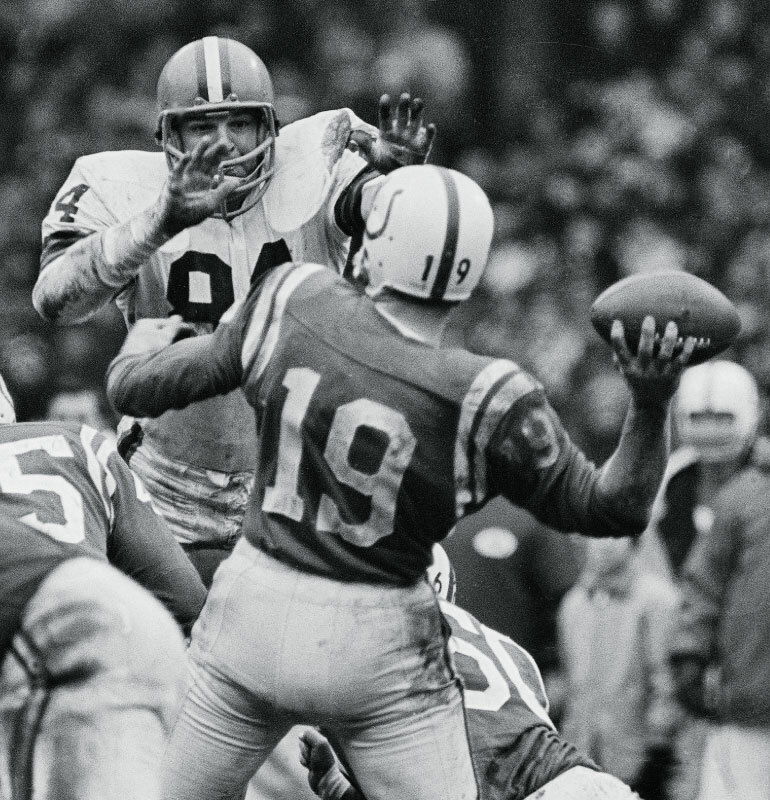 Although Kilmer was always called hard-nosed, it was not literally true, as Giants defensive end Jack Gregory demonstrated in 1976, when Kilmer was 37 and the last quarterback in the NFL to still wear a single-bar face mask. 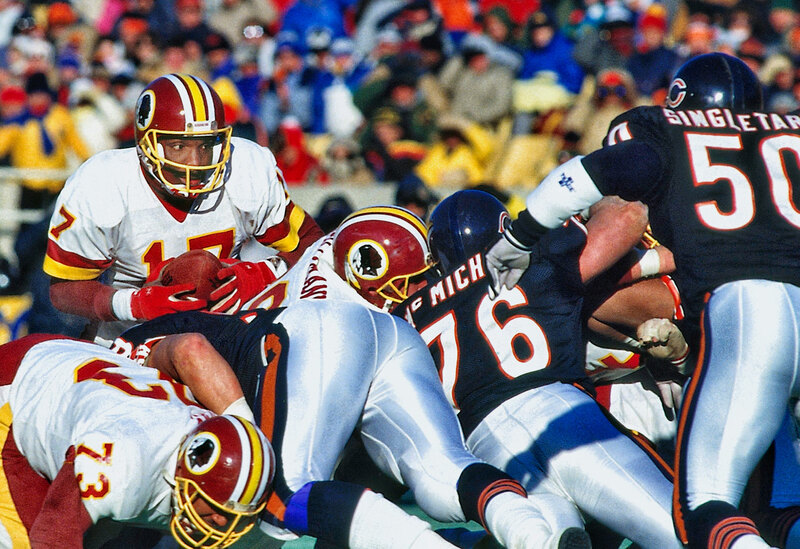 Down 17–12, Kilmer had led the Redskins to midfield when Gregory landed on him (as one game story put it) “like a baby grand piano.” Kilmer’s nose was shattered and gashed and he exited the game, bleeding, replaced by the younger Joe Theismann, whose own career would come to a gruesome end against the Giants nine years later. 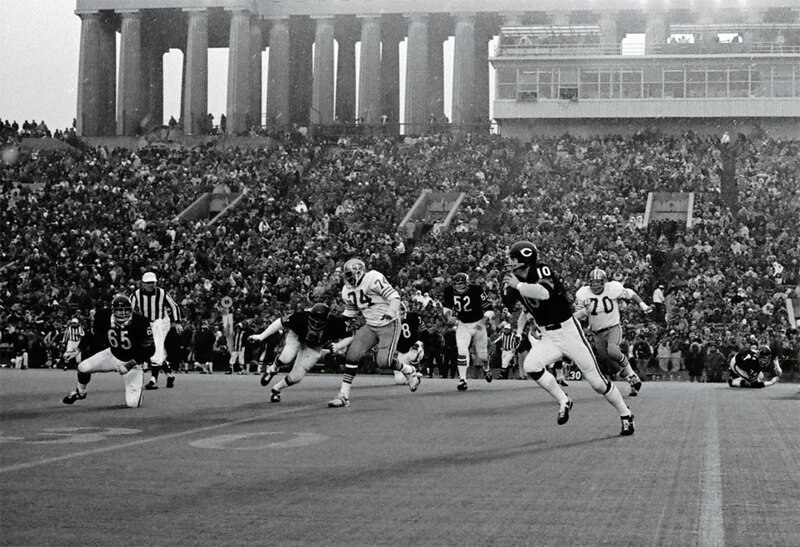 Theismann lasted one play, overthrowing a receiver, after which Kilmer returned to throw the game-winning touchdown pass with 40 seconds on the clock. But then quarterback toughness doesn’t die, or even fade away. 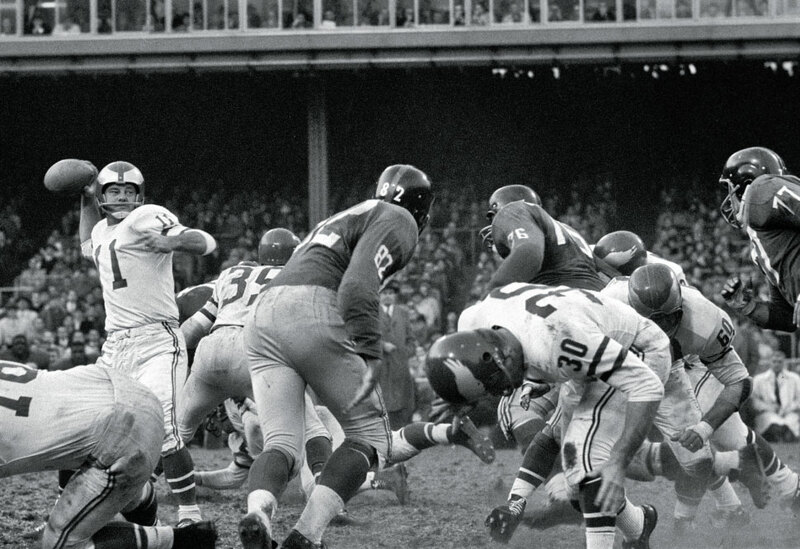 Like any good QB, it keeps on throwing—haymakers, in the case of 73-year-old Joe Kapp. Which isn’t to say that tough guys always win. 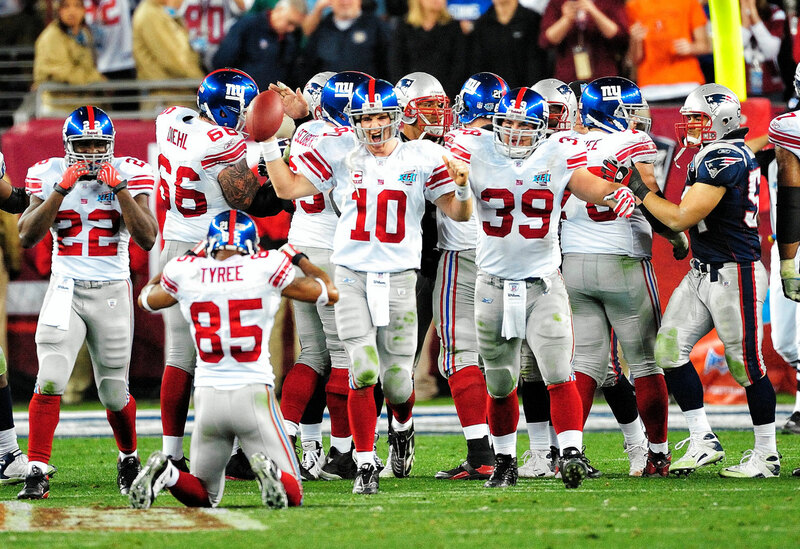 On the contrary, in the second game of his 17th season, Giants quarterback Y.A. Tittle was hit by John Baker, the Steelers 6’ 7”, 280-pound defensive end, immediately after throwing a pass. Tittle was concussed on the play, and cartilage in his rib cage was torn, a physical toll captured that day in photographs of the quarterback after the hit—on his knees, bleeding, his helmet behind him like a guillotined head—as the pass was intercepted and returned for a TD. The quarterback had grown up in East Texas with the name Yelberton Abraham Tittle, which might have hardened him at an early age. He obstinately declined to sit out the next game, though he was barely released from the hospital in time, and he played out the rest of the 2-10-2 season, the last of his Hall of Fame career. He was 38 years old. As an apparent peace offering, Kapp gallantly tried to give Mosca a sprig of flowers. Mosca blithely declined by deflecting them with his hand. Kapp hit him with the flowers and Mosca returned the blow with his cane. As the fists began to fly, the truth of what Norman Mailer once said became unmistakable: Tough guys don’t dance, not even at 73. 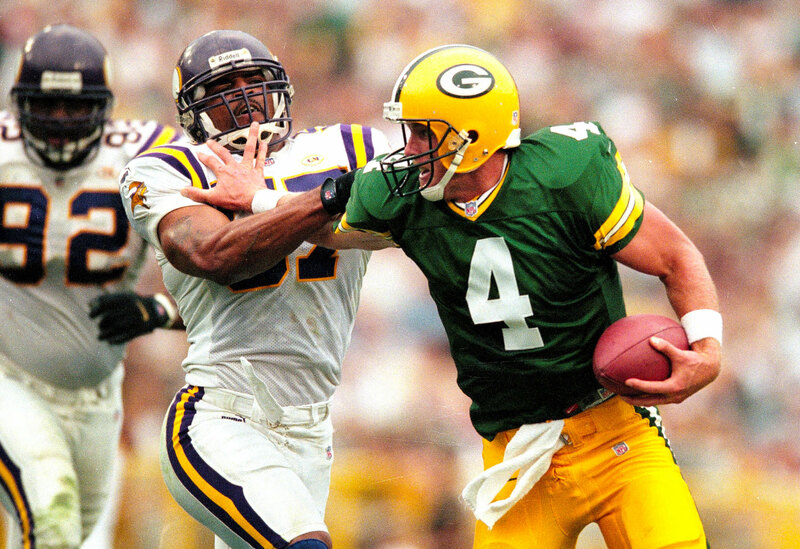 BRETT FAVRE He played with ankle and knee sprains, a separated shoulder, even a broken thumb during 321 straight starts, 94 more than the next best quarterback. 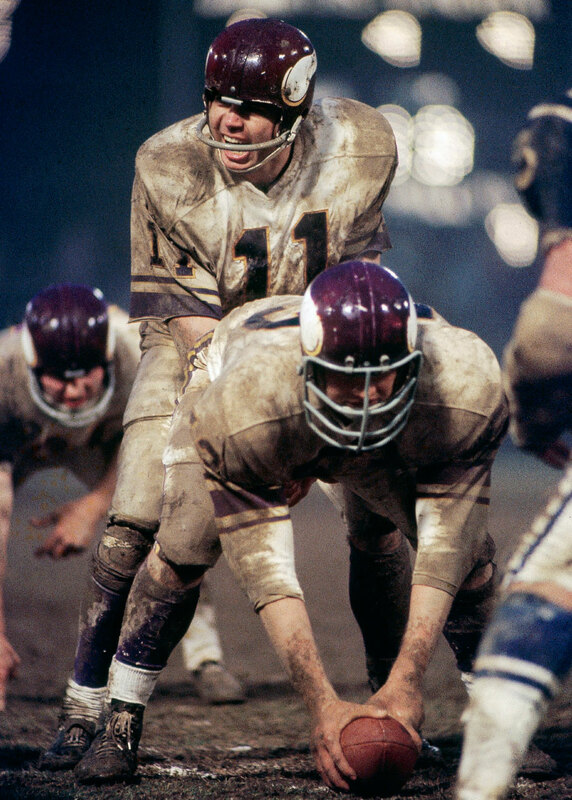 JOE KAPP proved that he could take a hit—and dish one out—in his 12 flinty seasons in the CFL and NFL. JOHNNY UNITAS He was admired for his guts against the pass rush, but he was revered for his mental toughness and indomitable leadership. There is beauty in the deep ball, especially when launched by those who can really air it out. Such men are invariably described with military terminology, They possess “cannons” or “howitzers” where most mortals have only an arm. They throw “rockets” and “bombs.” They are, inevitably, “gunslingers.” And they are indeed a sight to behold. 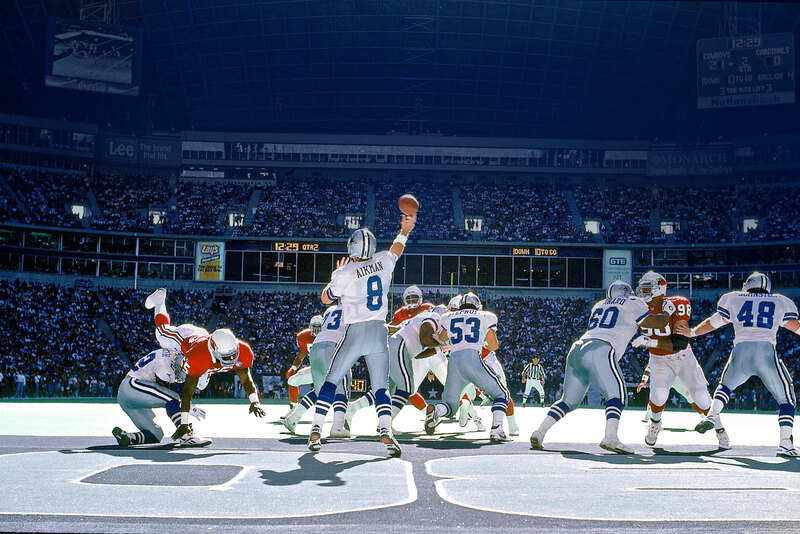 But they are useless without smarts and accuracy and poise, the three most valuable traits for any quarterback. 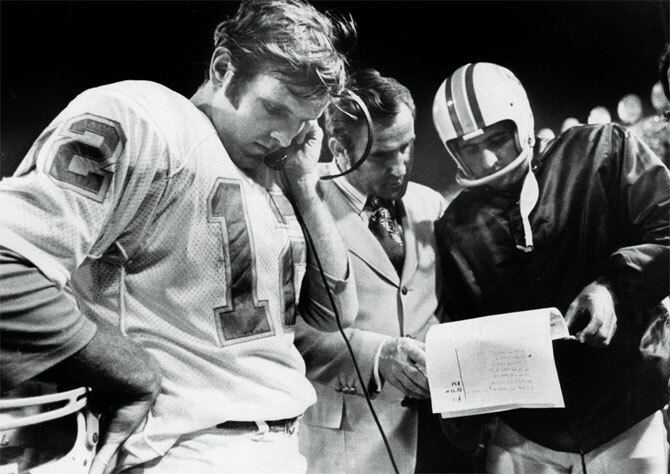 Griese (12), with coach Don Shula and backup George Mira, had an accountant’s mien and a killer instinct. So let us now praise men of mostly modest arms, those QBs who may not be able to puncture a receiver’s chest at 40 yards but will get you 10 yards when you absolutely need it and, more important, win you the game in the process. These are the Chess Masters, those ball-through-a-tire-swing deadeyes who possess the gift of touch, but more important than that, a preternatural grasp of both their team’s capabilities and their opponent’s. Cerebral players like Peyton Manning, relying on fluttering half-armed passes at age 37; Joe Montana, lofting the ball into the corner of the end zone to Dwight Clark; Tom Brady, completing a surreal 26 out of 28 passes in a playoff game; Bob Griese, a.k.a. 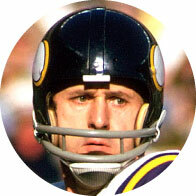 “The Thinking Man’s Quarterback,” calling every play for the entirety of his career; and Ken Anderson, a man with a law degree who played the game with a rare precision, dinking and dunking his way to a bevy of NFL records for completion percentage. At first blush they are not intimidating figures, and few had an easy road to the NFL. Bart Starr was drafted in the 17th round of the 1956 draft. Johnny Unitas was released by the team that drafted him, the Steelers—amazingly, head coach Walt Kiesling believed him not smart enough to quarterback an NFL team. 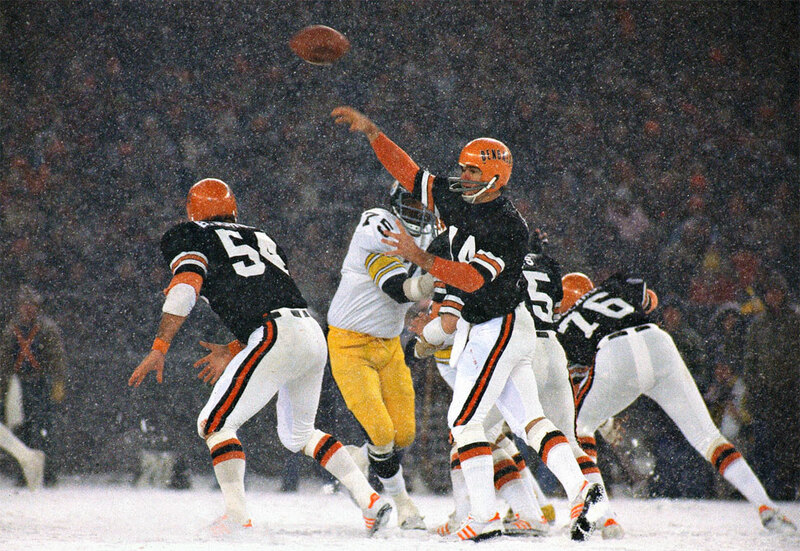 Unitas worked construction outside of Pittsburgh to support his family, playing QB on a local semipro team for as little as $6 a game on the weekends before making the Colts in a tryout. 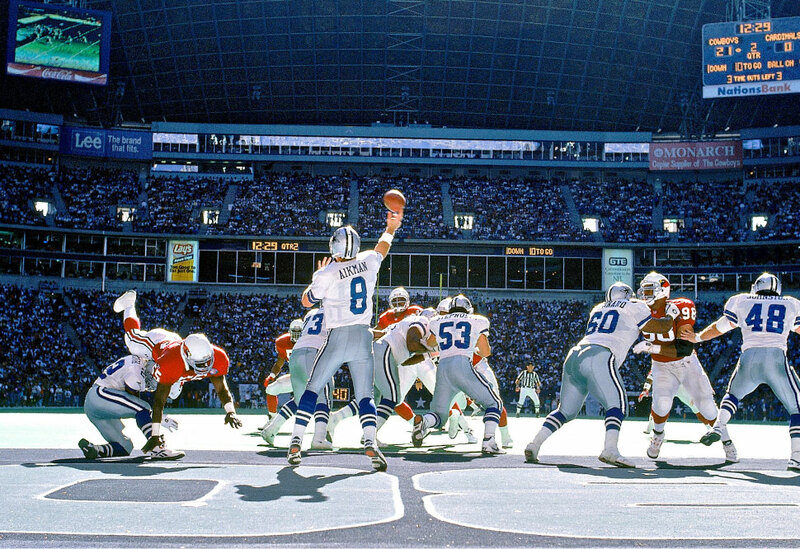 Len Dawson completed all of 21 passes in his first five NFL seasons and was released by the Browns before catching on with the Dallas Texans, who would go on to become the Kansas City Chiefs. During scouting workouts, Montana graded out as a 6 on a 1-to-9 scale for arm strength—and 61⁄2 overall—before the 49ers took a chance on him with the 82nd overall pick. Tom Brady? He bears the dubious distinction of running the slowest QB time in NFL combine history in the 40-yard dash, at 5.28 seconds (for comparison, the not-exactly-fleet-footed Aaron Rodgers clocked 4.71). The result: 198 players were selected before Brady in the 2000 draft. Even Drew Brees, a college star who left Purdue as the Big 10’s alltime leader in passing yards and TDs, slipped to the second round of the 2001 draft based on his six-foot stature and perceived lack of arm strength. 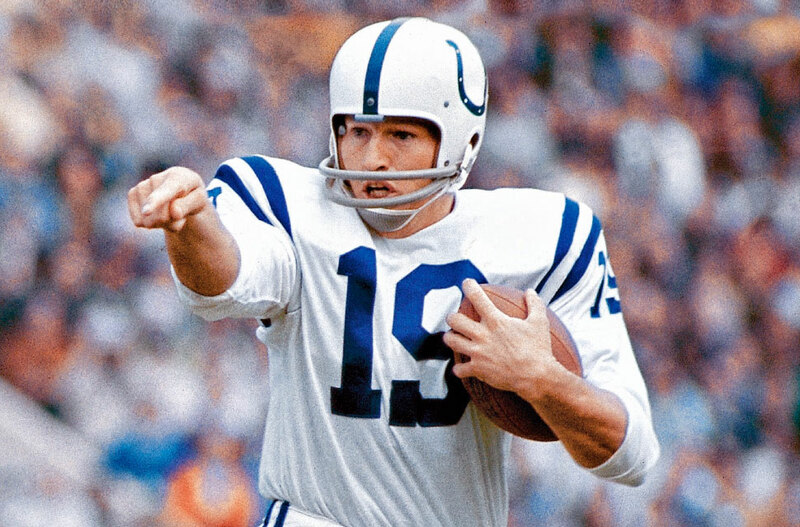 Unitas worked construction outside of Pittsburgh to support his family, playing QB on a local semipro team for as little as $6 a game before making the Colts in a tryout. Each of these men made some coach, or general manager, look like a genius. 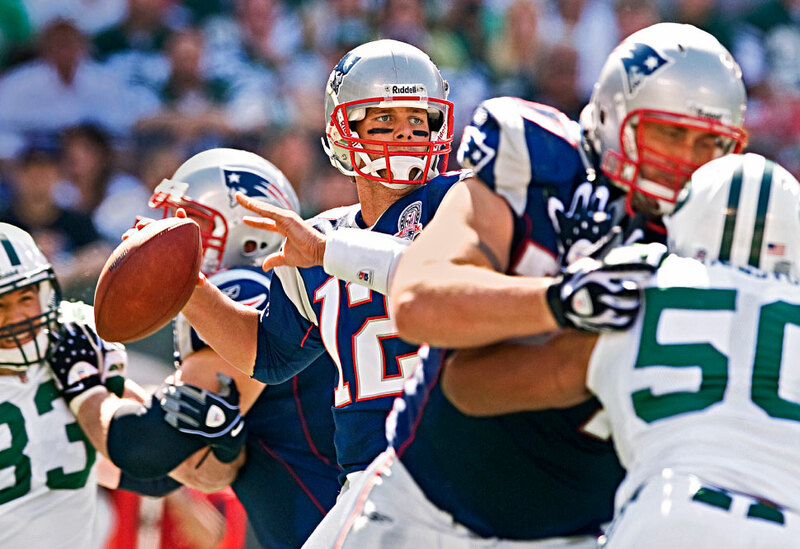 (Brady is considered by some the best draft choice in NFL history.) 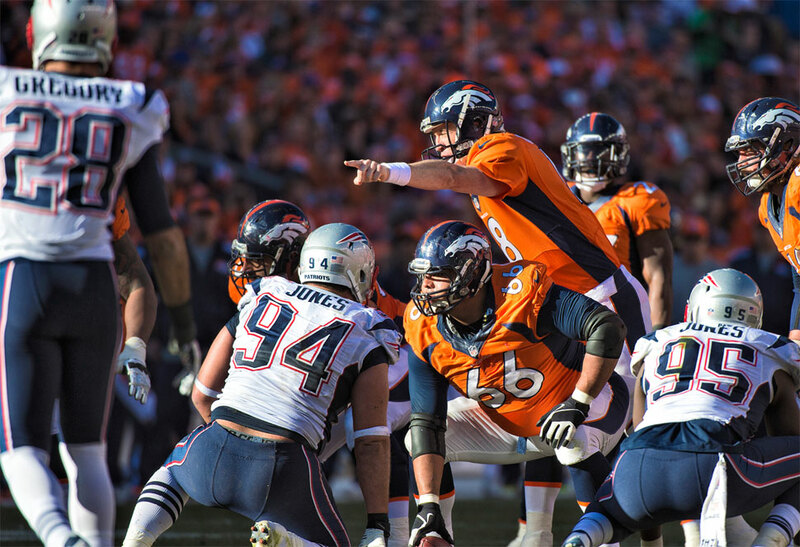 Some, like Manning, succeed through obsessive preparation and an uncanny talent for reading defenses at the line of scrimmage. Others, like Brady and Montana, possessed an ability to maintain their poise under even the most intense pressure. Starr, born into a military family, understood the value of discipline and, above all, teamwork, making him the perfect complement to coach Vince Lombardi. Len Dawson found his coaching muse in Hank Stram, who played to Dawson’s strengths with his “moving pocket” offense. Likewise, Boomer Esiason brilliantly orchestrated Sam Wyche’s then-innovative no-huddle offense. And both Anderson and Montana played in the earliest editions of Bill Walsh’s West Coast offense, throwing darts on screen passes to running backs and leading receivers perfectly on slant patterns. 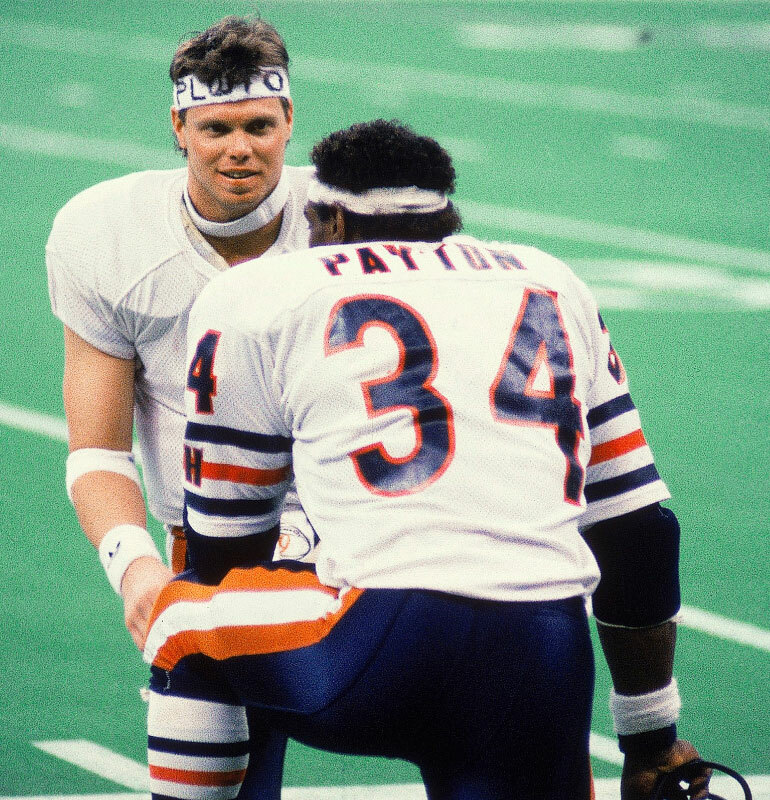 When the two squared off in 1982, it was a showdown between perhaps the two most accurate passers in NFL history. Sure, Montana came out on top, but few remember that Anderson completed 25 of 34 passes in the game, setting Super Bowl records at the time for both completions and completion percentage. What truly unites these men, though, is the most important marker in the game: victories. Forget passing yards and other fantasy football stats. These QBs won, in whatever fashion was required. 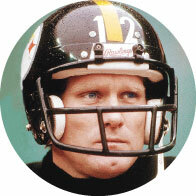 Starr won five NFL championships, including three titles in a row, a feat unmatched before or since. Griese was the starting quarterback for the Dolphins during the 1970s when the franchise had the highest winning percentage in all of pro sports. Montana retired with a remarkable 133–54 record as a starter. Brady won a Super Bowl when he was but 24. 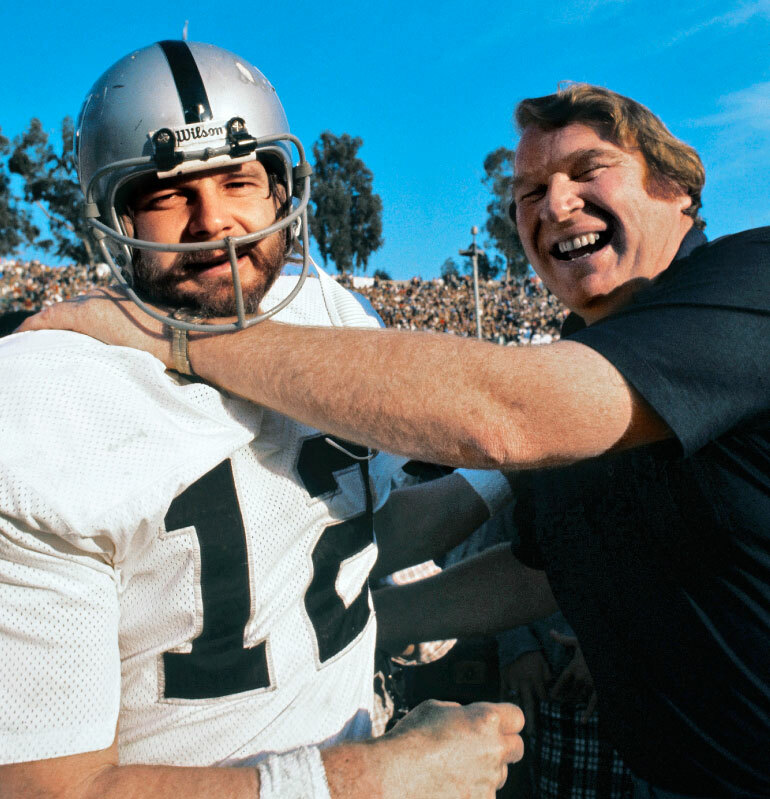 Not only that, he was the quintessential game manager that day, despite his youth: 145 yards and one touchdown in defeating a Rams team favored by 14 points. What’s more, Brady did so by leading the team on an epic drive with 1:21 remaining and no timeouts as, on the TV, John Madden recommended that the Patriots run out the clock and take their chances in overtime. As for Brees, when he finally reached the Super Bowl, he beat the Colts by completing 32 passes, a total matched only by Brady (in 2004) and bettered only by Peyton Manning (in 2014). What unites these men, though, is the most important marker in the game: victories. Forget passing yards and other fantasy football stats. These QBs won, in whatever fashion required. PEYTON MANNING At age 37 and two years after major neck surgery, he had a historic 2013, setting NFL records for passing yards (5,477) and touchdowns (55). 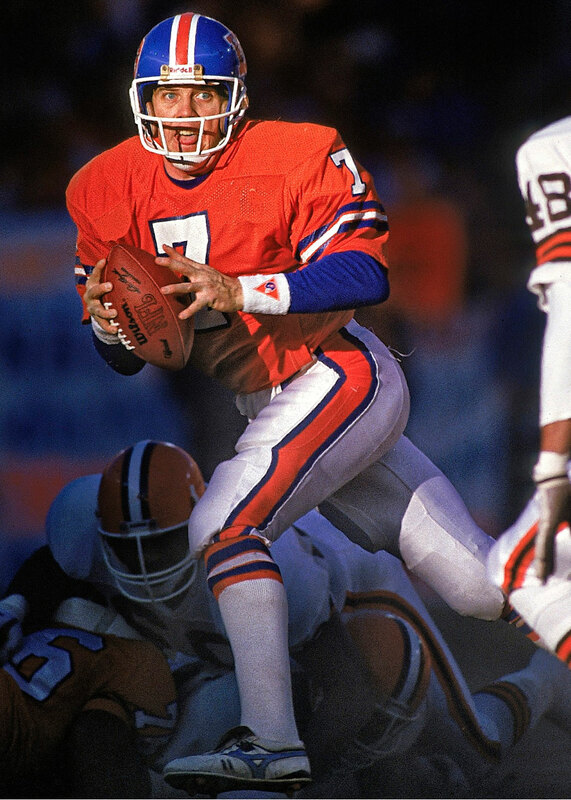 KEN ANDERSON He spent five seasons pioneering the West Coast offense with Bill Walsh as his quarterback coach and later won league MVP honors, in 1981. TOM BRADY Questions about his arm strength and speed made him a sixth-round pick in 2000, but he has won more postseason games (18) than any other quarterback in NFL history. 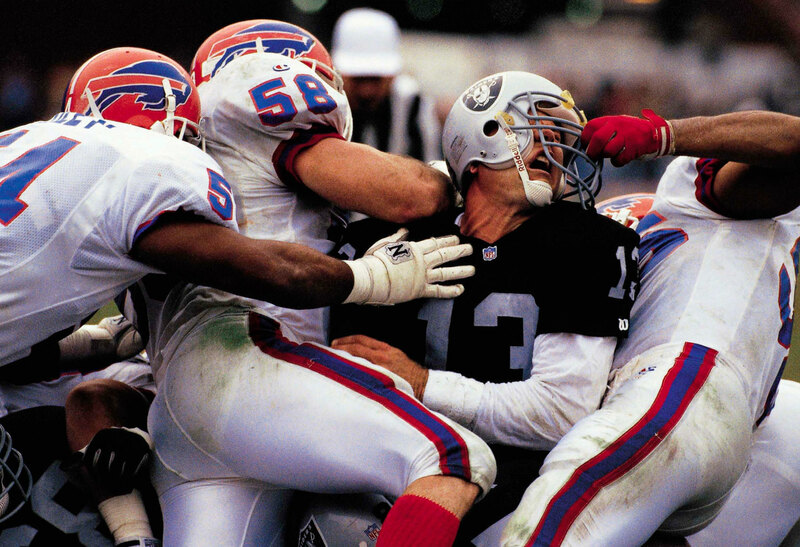 JAY SCHROEDER The Raiders’ QB probably thought a face mask penalty was not a great enough punishment for what the Bills did to him in a 1991 game. 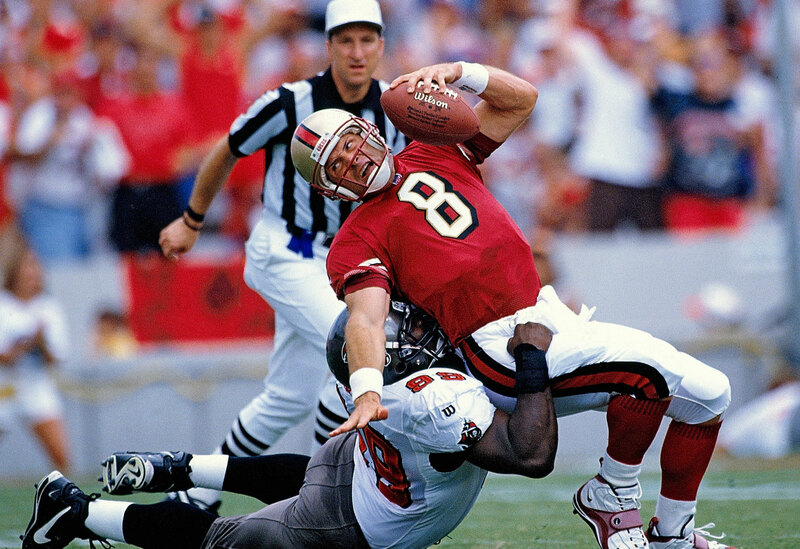 STEVE YOUNG He may have been one of the most elusive quarterbacks ever to play the game, but Young couldn’t escape the clutches of the Bucs’ Warren Sapp forever. 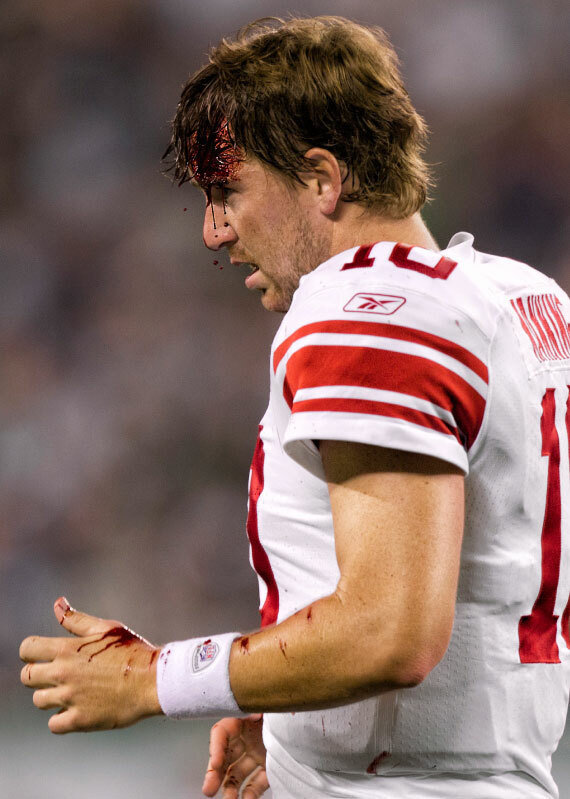 ELI MANNING Even an exhibition game can be treacherous for a QB, as Manning learned the hard way in a bragging-rights showdown between the Giants and the Jets in 2010. 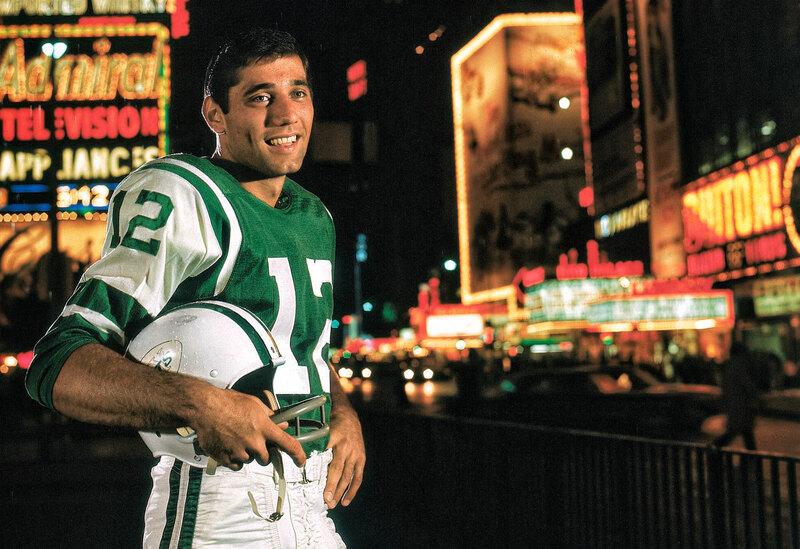 JOE NAMATH Broadway Joe was a big deal as a rookie in 1965, posing on the Great White Way, but his fame would rocket with his win in Super Bowl III. AARON ROGERS The Packers star (here with Da Bears fans) took up selling insurance for State Farm in 2012. 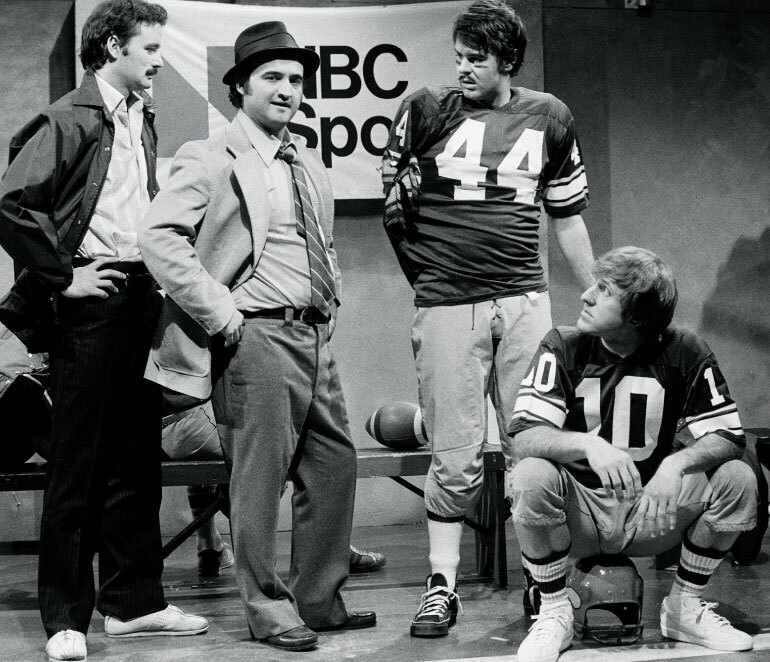 FRAN TARKENTON The NFL’s most acclaimed scrambler sat still for a while to listen to Coach Belushi on Saturday Night Live in 1977. Over the years, five NFL QBs have had their mettle tested on SNL. 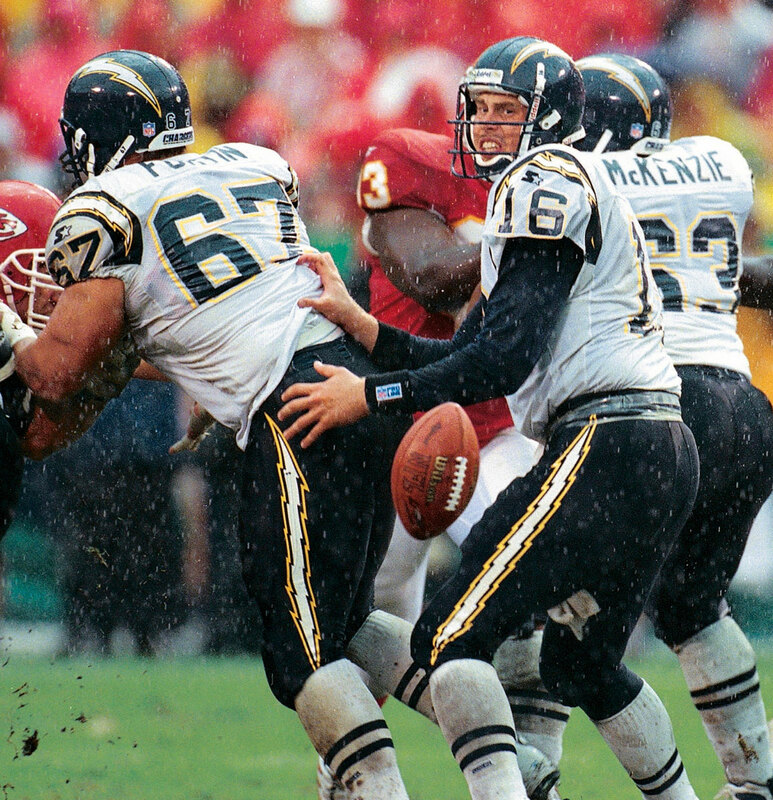 RYAN LEAF The second overall choice in 1998, Leaf was a toxic mix of arrogance, inability and injury until the Chargers released him three years later. 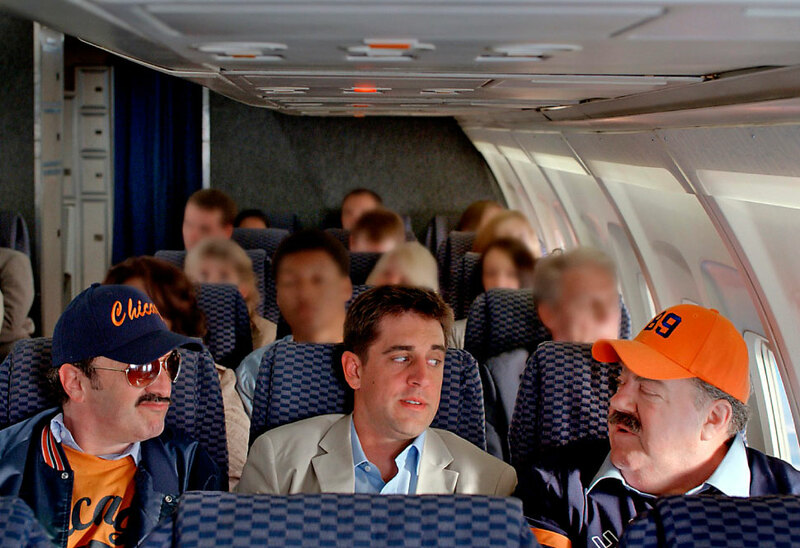 He was bred to be a quarterback—his father, Marv, stretching his son’s infant hamstrings, teething him on iron-rich frozen liver—[but] his football-only upbringing left him unprepared for adult urges; and wasted, arrest-riddled years followed. TODD MARINOVICH Raised on a junk-food-free diet, the Raiders’ 1991 first-round pick also had an appetite for drugs that helped end his NFL career after two seasons. 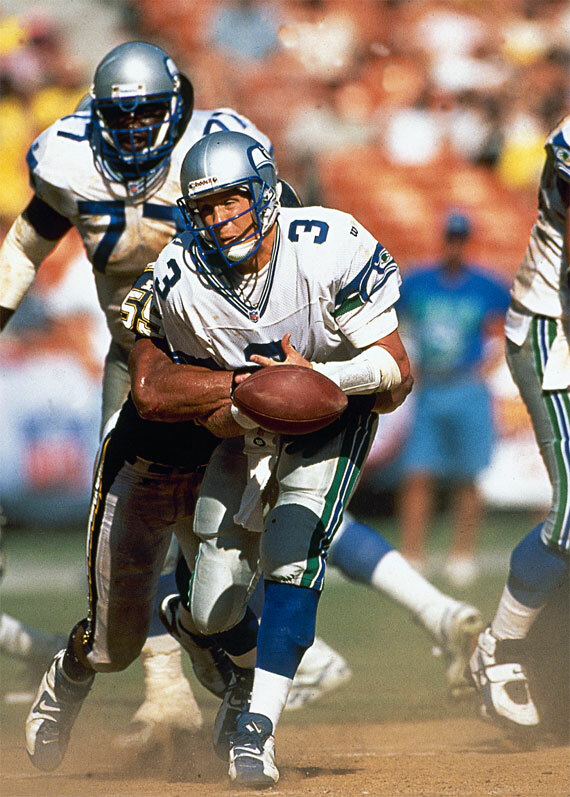 RICK MIRER The “next Joe Montana” out of Notre Dame, Seattle’s top pick in 1993 played eight seasons with five teams and had a 24-44 mark as a starter. On January 31, 1988, Marlin Briscoe was sitting in a San Diego jail, locked up on drug possession charges, watching Doug Williams become the first African-American quarterback to win a Super Bowl. After a nine-year pro career during which he became the first black quarterback in modern pro football history, for the Denver Broncos, Briscoe’s life was in ruins from a crack cocaine addiction. Yet when the Super Bowl ended, the tears that ran down his face were joyful. Thrower won a title at Michigan State before becoming the first African-American to take snaps at quarterback in the modern NFL. He was right. Briscoe, who ultimately conquered his drug problems and went on to become an administrator at Boys & Girls Clubs in Southern California, was one of the trailblazing black quarterbacks who chipped away at the racial stereotyping that for decades had made quarterback a whites-only position in the NFL. Some of these pioneers had distinguished careers, like Williams and Warren Moon. Others had just a brief chance to take snaps under center, like Briscoe and the aptly named Willie Thrower. But they were all instrumental in breaking down the league’s racial barriers. Even after the blackballing ended, opportunities for blacks to play quarterback were limited because of a prevailing belief that they lacked the intelligence and leadership ability to play the position. For years African-Americans who had played quarterback all their lives hit a wall once they reached the NFL. After starting at QB in college at Minnesota, Tony Dungy went undrafted and had to accept a switch to safety when the Steelers signed him as a free agent in 1977. 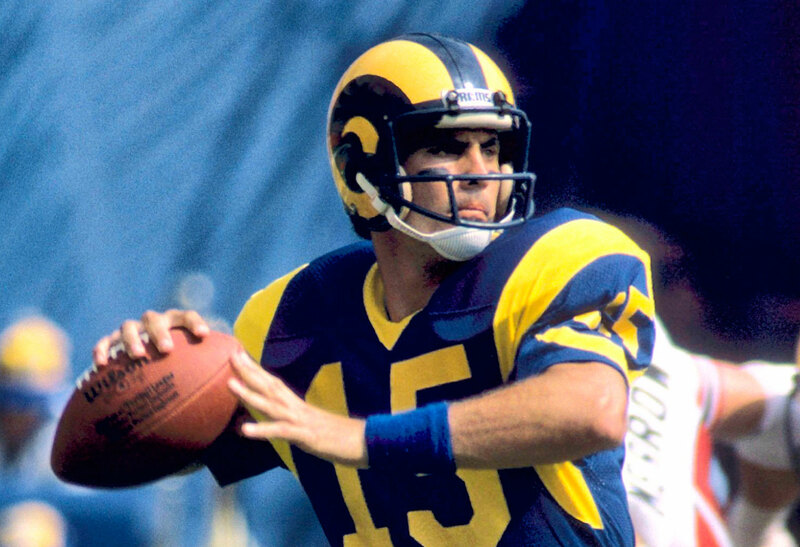 The league was similarly uninterested in Moon as a quarterback, even after a stellar career at Washington that included the Rose Bowl MVP award in ’78. 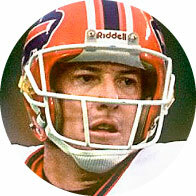 Moon signed instead with the Canadian Football League and starred there for six seasons before attitudes changed enough for him to get his chance in the NFL, where he became a first-ballot Hall of Famer. It’s regrettable enough that dozens of would-be black quarterbacks from the 1930s to the ’80s experienced similar resistance from the NFL. But there is also no telling how many other young black athletes were either steered away from the position or chose not to play it at the youth level because they saw no chance of a professional future at QB. After the anomaly of Pollard, progress was slow. In 1949 George Taliaferro became the first black player ever to be drafted by an NFL team when he was selected in the 13th round by the Bears. He signed instead with the L.A. Dons, who took him in the first round of the All-America Football Conference’s draft, and he threw for 790 yards that season. A year later, though, he joined the NFL’s New York Yanks and, while he did attempt seven passes, he was listed as a halfback and never took snaps under center. 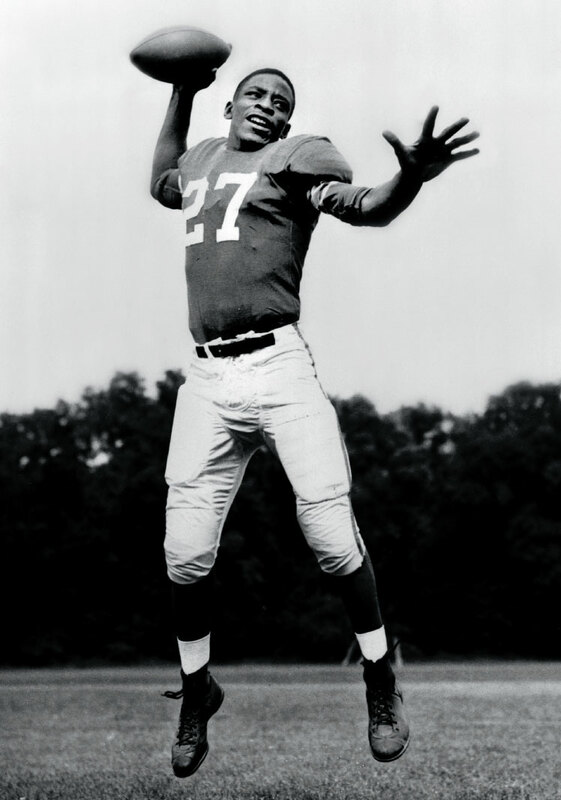 It wasn’t until Oct. 18, 1953 that an African-American took a snap as a T formation quarterback in an NFL game. Thrower, a former Michigan State quarterback who had gone—not surprisingly—undrafted, replaced struggling Bears QB George Blanda against the 49ers at Soldier Field in Chicago. Thrower completed 3 of 8 passes for 27 yards before coach George Halas reinserted Blanda. Thrower didn’t throw another pass that season and never played in the NFL again, finishing his career in Canada. But his brief appearance inspired at least one future QB, namely Moon, who thanked him in his Hall of Fame acceptance speech. Every time a black quarterback took the field, however briefly, it pushed the door open wider for the next one, even if only a sliver. After Thrower, it was 15 years before Briscoe became the next black QB to appear in a pro game. The Broncos turned to him in 1968 after their starter was injured and his backups were ineffective, and although he threw for 14 touchdowns in 11 games, he was released before the next season. He signed with the Bills, who converted him to wide receiver. Briscoe never played quarterback again. There was no Jackie Robinson. Instead it was the cumulative effect of all the black QBs, over the course of decades, that slowly made the difference. Such were the small advances that black QBs made when opportunities arose. There was no Jackie Robinson, no one who broke through and immediately became such a great player that it was impossible to keep him on the bench. Instead it was the cumulative effect of all of the black QBs, over the course of decades, that slowly made the difference. 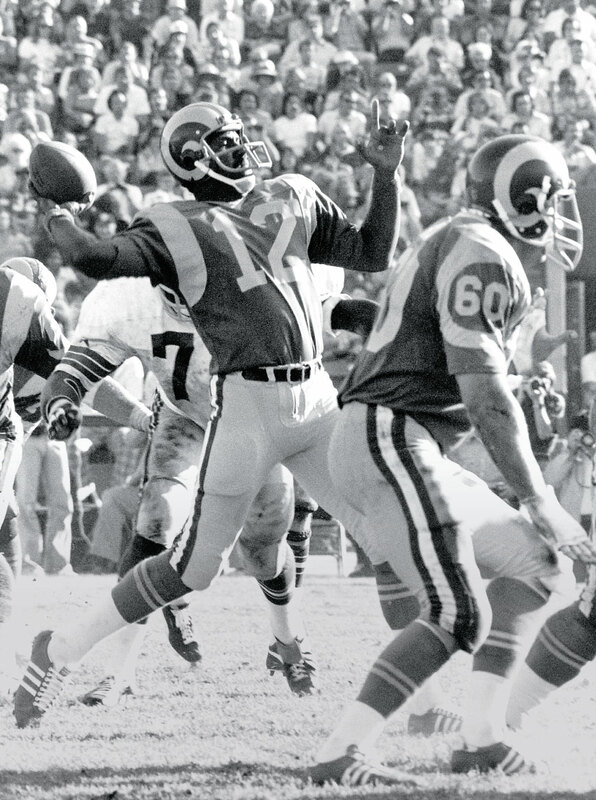 It was because of them that the idea of an African-American under center became a slightly less foreign concept, which helped lead to James Harris becoming the first black full-time starter at the position for the Los Angeles Rams in 1974. Then came Williams, whose Super Bowl performance was impossible for the football world to ignore. After a week of pre-Super Bowl questioning from the media about the historical significance of being the first black quarterback to reach the title game, Williams responded to the pressure by throwing for 340 yards and four touchdowns while winning the MVP award in the Redskins’ 42–10 rout of the Broncos. After that, it was no coincidence that the influx of black quarterbacks became, if not a flood, then at least more than a trickle. 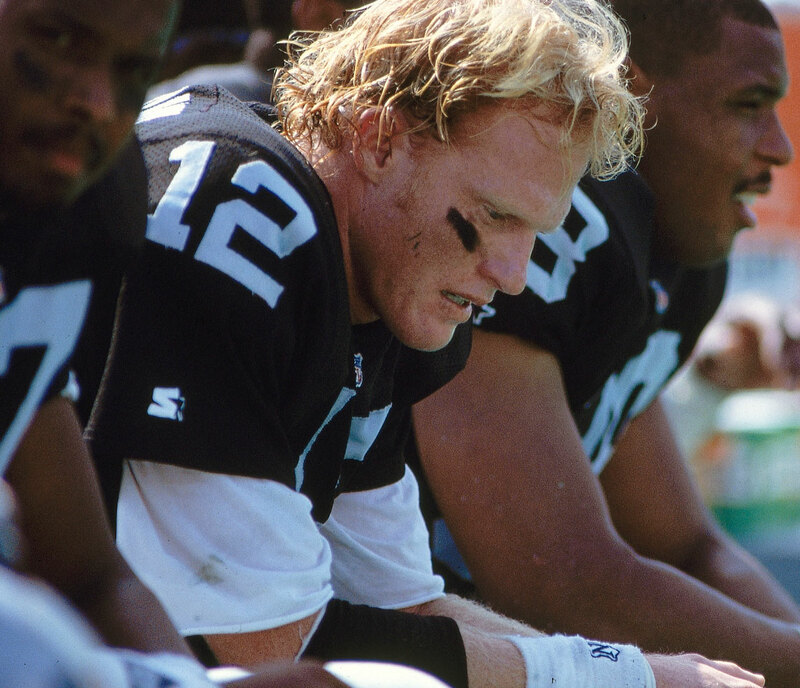 Until then, there had rarely been more than one black starter in the league at any time, but in the 10 years after Williams’s MVP performance, multiple QBs, including Moon, Randall Cunningham, Rodney Peete, Jeff Blake, Steve McNair and Kordell Stewart all became starters. The QBs that would follow them in the decades to come—Donovan McNabb, Cam Newton, Robert Griffin III and Russell Wilson among them—stand on the shoulder pads of these pioneers. With their talent and even more than that, their persistence, they made the NFL a racially more enlightened league in which the sight of a black quarterback is no longer uncommon. The NFL cannot be proud of the discriminatory parts of its history, but at least it’s just that—history. DOUG WILLIAMS He was the first black quarterback to be taken in the first round of the NFL draft, in 1979 by the Bucs, but he would earn lasting fame in Washington. JAMES HARRIS He was the first African-American quarterback to win a postseason game, with the L.A. Rams in 1974, and the first to go to a Pro Bowl. 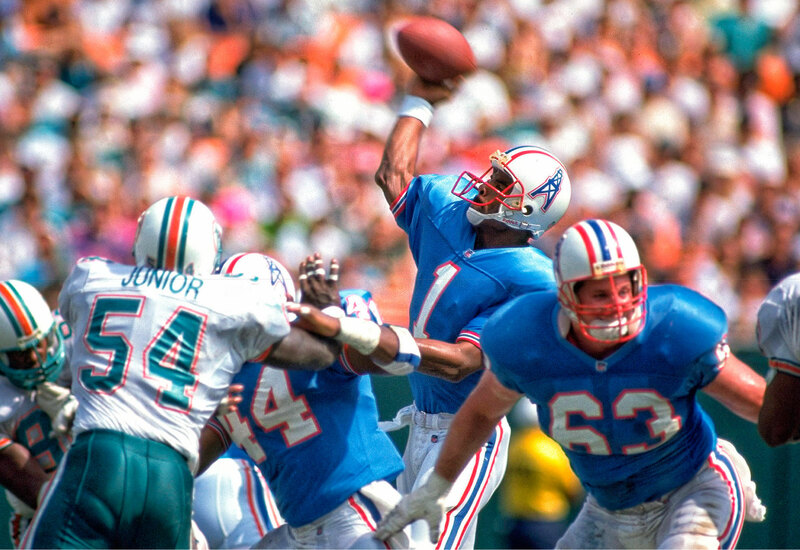 WARREN MOON Lukewarm NFL interest drove him to the CFL out of college, but he would become the NFL’s highest-paid player with Houston in 1989 and go to nine Pro Bowls. 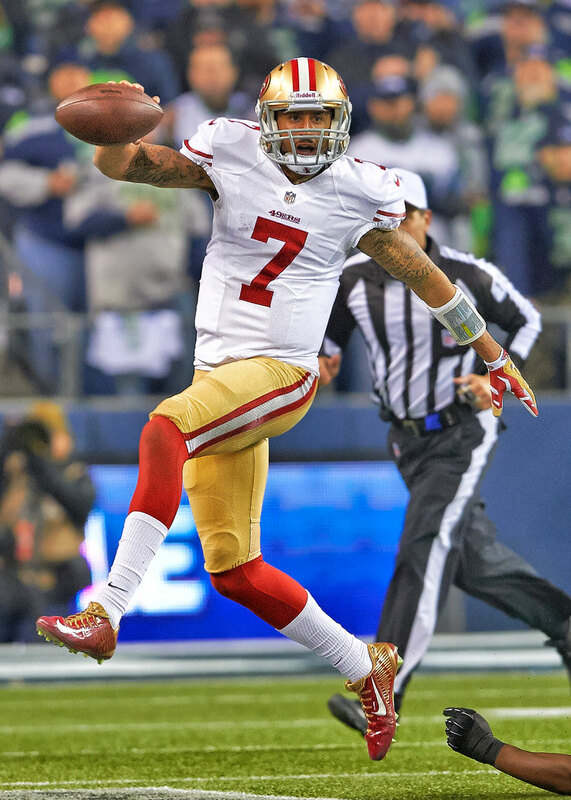 COLIN KAEPERNICK A starter for less than two seasons, he has nevertheless led the 49ers to a Super Bowl and an NFC championship game appearance. 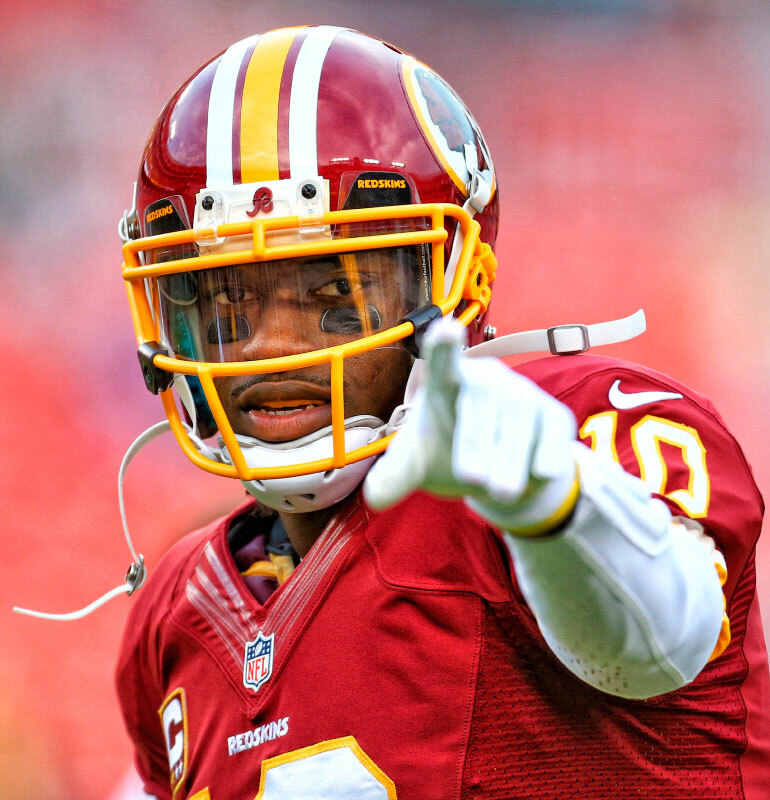 ROBERT GRIFFIN III As a 22-year-old rookie, RG3 opened his career with a scorching eight completions on his first eight pass attempts and would go on to electrify Washington fans, but by year’s end a knee injury clouded his future. RUSSELL WILSON The Seahawks took a chance on an undersized QB and he rewarded them with a mobile threat, few mistakes and the franchise’s first title.